But it's not really clear to me your problem. What program and version is your issue with . and what version of Windows are you using ? Be best if you could show us a screenshot or Video grab of your issue . So, the problem is can i remove the blue help button? Those first two, I believe, we cannot change. The "header bars" can be change via skinstudio header bars section as below. Jesus, iv been looking for days how to change that! Hey, im also having trouble changing the explorer text and getting rid of the sharing icon.....any thoughts? 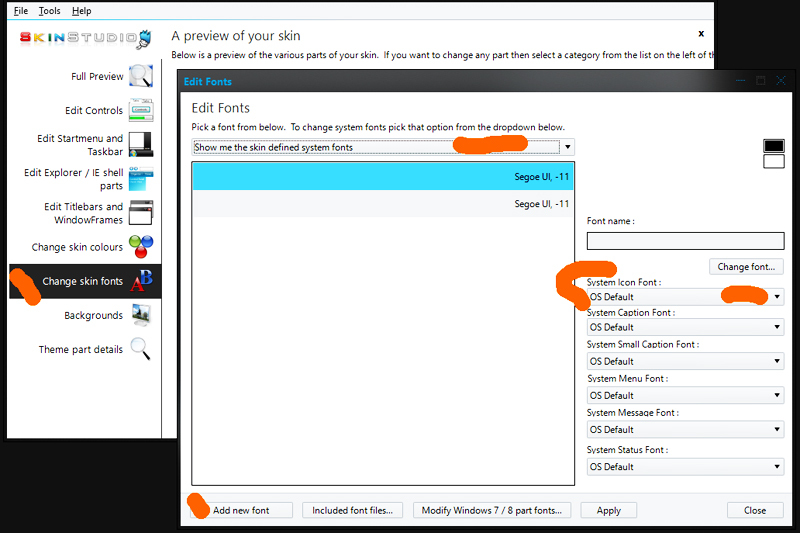 ps, i used to be able to change the font of everything in windowblinds itself (modify style/ do you want to over-ride the font) and choose a font, and off we go. Now this doesnt change, well 5% of the time it might, but certainly not like it used to. It does change title bar fonts, status bar fonts, but not explorer fonts anymore? he comes on duty tonight and see what he thinks , stay-tuned. 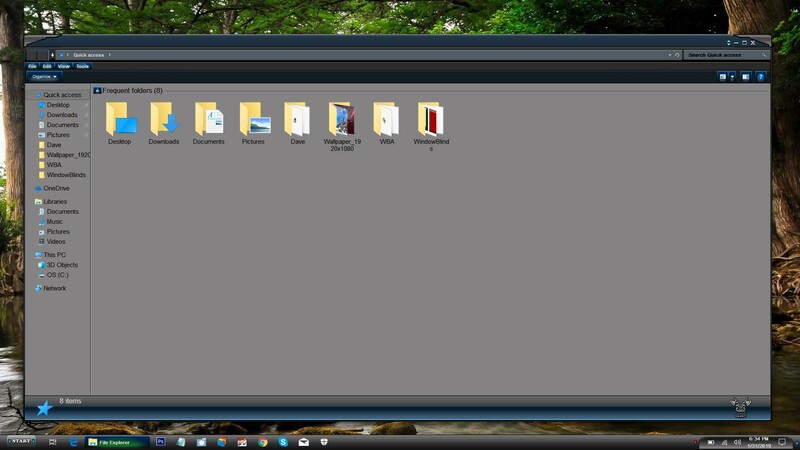 As far as I know, I don't think you can change Windows Explorer font in Windows 10. But, someone might come along and said I am wrong. And on those sharing icon overlay, I am not sure but I don't think Windowblinds can control those. Change skin fonts / "Show me the skin defined system fonts" / "System Icon Font"
That'll also change the desktop icon font, probably something else somewhere too. A lot of times I have to switch to a different skin and then back to the one I've changed the font on before the change will show in Explorer. Now thats what im talking about!!!!!!!!!!!!! thx so much dude, just what i needed, and yes, pain in the arse having to change blinds for it to work, but it works! so, last question, i know you did say i cant do anything with the sharing icon, but can i do ANYTHING with it!! I cant even seem to change it (which i totally thought i could use a blank icon), and i have googled, but surely some of you geniuses on here have a suggestion right? DaveRI gave you the location which you were able to make work for you. I have changed a few over the years and have the full description written down so my old brain can use if it forgets. You may want to copy and paste into notepad and save for future. Change Skin Fonts. Edit Fonts/Show me the skin defined system fonts. Add New Font. Choose the font you want to use and size. Click apply. Now go to "System icon font" Change from OS Default to your new font. Click apply. What I know this changes. Left side of Explorer Window. Top menu text. Now use the new font in the "System Menu Font". Changes the right side of the Explorer Window. Also change system small caption font. To add to the list of what actually changes do one at a time and check and make note. I know Fences text and Photoshop drop down menus also change. NOTE: This works on win7/8/10. Here is a screenshot from my win10 computer. this "orange" bar when i mouse over stuff.....where the hell is it so i can change, 3 hours and i just cannot find myself! "Edit Explorer / IE shell parts" /Edit Explorer parts/ListView/Selection image [Image]tab. That's also the image you see in File Explorer when you mouseover a filename. Yes sir, it is, again, thx for ur time guys. 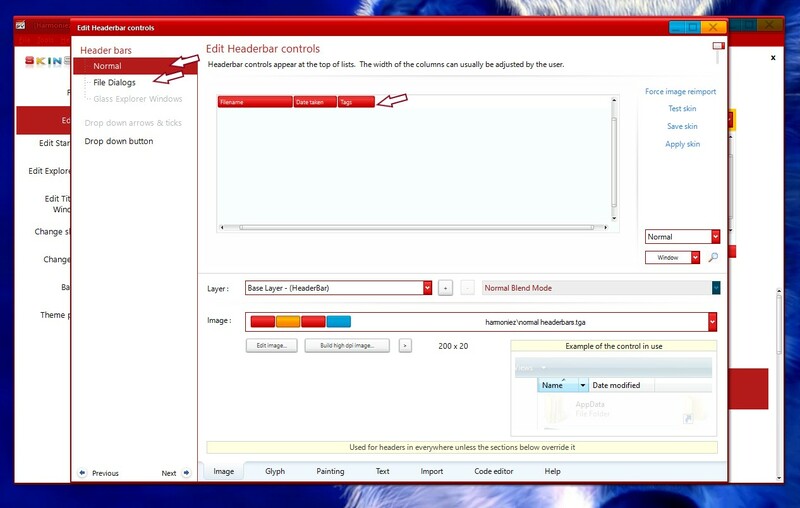 just noticed annoying icon in top left hand side on top of windows title bar frame (like windowblinds icon if you have that open, or a computer icon if you have my computer open)......i know i can get rid of this, but again....where is it! Set both "System Icon Alpha" settings to "0"
Also would probably want to do the UIS2 frames. Scroll down to "System Icon" button, click on it to highlight it, click on the "Delete" button over to the right. You're going to delete whatever button you have selected, so be sure you have the "System Icon" button selected.